06/02/16 - 1:30pm - Syndicated food columnist Linda Gassenheimer, Special wine correspondent Fred Tasker and WLRN hosts Joseph Cooper and Bonnie Berman in-studio interview with Le Bernadin Michelin 3-star chef and television celebrity, Eric Ripert. His latest book, 32 Yolks, is his memoir telling how he developed his passion for food and created one of New York’s top restaurants. It is the only restaurant to have earned five consecutive four-star ratings from The New York Times. 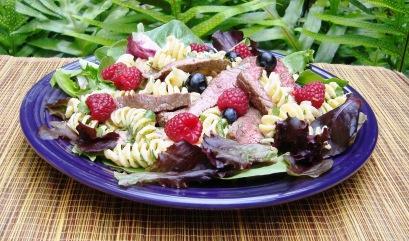 Beef and Berry Pasta Salad: This 15 minute salad uses ripe berries that are in season now. Here’s a cool, fresh berry and steak salad for warm summer evenings. It’s a one dish meal that can be ready in less than 15 minutes. Berries are at the height of their season and are a treat. They add a sweet flavor to the tangy dressing made by adding Dijon mustard and prepared horseradish to mayonnaise. I add a little warm water to mayonnaise to make it into a sauce without adding more calories. Sauteed steak goes well with the horseradish sauce. To make this an even faster dinner, you can substitute cooked chicken, shrimp or Deli roast beef for the steak. They don’t need cooking. Simply toss them in the salad. Place a large saucepan filled with water on to boil. Add pasta and cook 10 minutes. While the pasta cooks, heat a small nonstick skillet over high heat and spray with vegetable oil spray. Add steak and brown 2 minutes, turn and brown 2 minutes. Lower heat to medium and cook another 2 minutes. A meat thermometer should read 145 for rare or 160 for medium. Remove to a cutting board and sprinkle with salt and pepper to taste. Let rest while preparing the sauce. Mix mayonnaise, water, horseradish and mustard together in a medium-size bowl. Whisk until smooth. Drain pasta and rinse in cold water. Drain thoroughly and add to the bowl. Slice steak against the grain into thin strips. Add to the bowl with any juices released by the steak. Add salt and pepper to taste and toss well. Line 2 dinner plates with the salad greens. Spoon pasta salad on top. Sprinkle berries and chives on top. Makes 2 servings. To buy: 1/2 pound skirt steak, 1 package fusilli (corkscrew) pasta, 1 bag washed, ready-to-eat salad greens, 1 bunch chives (optional), 1 container raspberries, 1 container blueberries and 1 bottle prepared horseradish. Staples: Vegetable oil spray, reduced-fat mayonnaise, Dijon mustard. salt and black peppercorns. Any berries or other summer fruit can be used. Any type of short-cut pasta such as penne or elbow macaroni can be used. Any type of quick-cooking steak can be used. An easy way to chop chives is to snip them with a scissors. When Carlos Frias sits down at a restaurant, he doesn't just focus on the food. He's actually more interested in the people who've created the meals. And when he writes, he likes to write stories that will make you hungry. We talk to the Miami Herald Food and Dining Editor to hear more about how a sports reporter ended up writing about food and -of course- what are the best places to eat in Miami right now. In some circles, instagramming pictures of your food is grounds for ridicule. But for food bloggers, it’s what brings home the bacon (all pun intended). I spoke to local food blogger Sef Gonzalez, better known as the Burger Beast, about what it’s like to run a food blog in a now foodie South Florida. How has the South Florida food scene evolved since you began blogging?